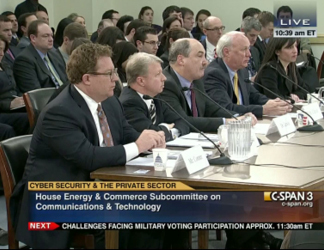 ISA’s long-standing efforts to create an economically viable and sustainable approach to cybersecurity reached a milestone following an unusually collaborative and non-partisan hearing before the House Energy and Commerce Subcommittee on Communications and Technology on February 8, 2012. After the hearing, Chairman Greg Walden (R-OR) and Ranking Member Anna Eshoo (D-CA) formed a bipartisan Task Force to investigate the use of market incentives to drive increased cybersecurity and cybersecurity investment. While cybersecurity historically has been a non-partisan or even bipartisan issue, it has become increasingly partisan over the past few years, particularly in the U.S. Senate, and with the creation of the House GOP Task Force on Cybersecurity. The February 8th Energy and Commerce Subcommittee hearing, however, brought a unique perspective and was a display of unusual unity. This unusual display of unity was also later evidenced when the House passed the Rogers-Ruppersberger Bill, H.R. 3523, a bill that embraced and utilized liability incentives to enhance voluntary cybersecurity information sharing among and between industry and government. During a recent Board meeting, ISA pledged to continue its work with the Subcommittee Task Force to help develop increasingly more sophisticated models for the use of market incentives to promote cybersecurity. For ISA President Larry’s Clinton February 8, 2012 Testimony before the House Energy and Commerce Subcommittee and all other ISA testimony, click here. To learn more about the unusual nature of the Hearing, click here for press articles reporting on the hearing. For the Subcommittee’s Hearing Notice, Webcast, and further information, please click here.